Al Arab Management Training Center is a training consultancy organization characterized by its multi-national and qualified experts who have been selected on the basis of international practices in their fields of specialization. The Center is committed to the quality and diversity of programs based on field research and knowledge of the needs of human resources of the highest quality. n addition to follow-up of our experts and training officials in their various locations to search and inquire about programs and what is new in the field. 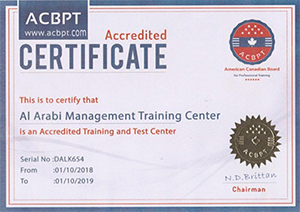 Al Arabi management Training center provides training, consultancy and clearing services in the fields of multi-management and finance, information technology, project management, port management and productivity. Al Sheikh Zayed Street, Ajman-UAE.